It seems absurd to think that a winemaking region as old and storied as the Languedoc in southern France would have sub-regions to “discover” but the truth is, historically speaking, the Languedoc is better known for vats of uninteresting co-op wines harvested mechanically from the flat lands of the Languedoc plains. Times they are a-changing. In the past few decades production of regional wines has decreased by half and appellation wine production has increased fivefold. While quality-focused producers in the established appellations are the major part of this pivot to a higher standard, there is also a new breed of young winemakers staking their claims in sub-regions that have only recently come to prominence. There’s no better example of this new breed of Languedoc winemaker than Vincent Guizard of Domaine Saint Sylvestre in the newly minted appellation of Terrasses du Larzac. Together with his wife Sophie, Vincent is cultivating less than 20 acres of prime vineyards in this appellation known for its unique climate that benefits from both the warm Mediterranean sea and the cool air that blows down from the Larzac plateau on summer nights, creating wines that are fresh, yet delicate, with silky tannins and the earthy garrigue aromas characteristic of the Languedoc. Vincent was raised working in the vines with his grandfather. In the late 90’s, he worked a couple of vintages with the renowned Olivier Jullien at Mas Jullien in Montpeyroux. From 2003 to 2010, he was part owner, in association with Frédéric Pourtalié, of Domaine de Montcalmès. It was 2010 that Vincent decided to break away from Montcalmès, taking 17 acres of vines with him, and creating Domaine Saint-Sylvestre with it’s first vintage release in 2011. 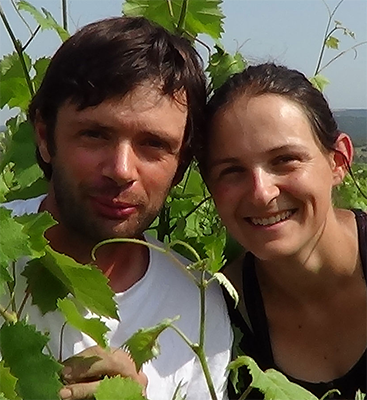 Vincent and Sophie employ a sustainable approach to viticulture, along the lines of “lutte raisonnée” (the reasoned struggle) and use no synthetic fertilizers or herbicides in the vineyards. Fermentation is completed using only indigenous wild yeasts. Domaine Saint Sylvestre Terrasses du Larzac Red is a blend of 70% Syrah, 20% Grenache, and 10% Mourvedre aged for two years in used barrels before blending and bottling. It exudes a heady nose of blackberry, garrigue, and smoke before a sappy yet balanced sip. While drinking well now, this wine will reward a few years of patience stored in a proper cellar. Exclusive to Elie Wine Co., Domaine Saint Sylvestre white is under the Languedoc appellation mainly because Terrasses du Larzac is presently only admitted for red wines. A blend of 45% Marsanne, 45% Rousanne, and 10% Viognier aged in used barrel for one year, the aromatic bouquet is incredibly complex with notes of flowers, spices, and orchard fruits. This is a superbly balanced white wine with just enough bracing minerality on the finish to match its gloriously ripe fruit.